The 49ers have the whole package; a running game, an elite tight end, a ferocious defense, and a head coach who turned around an entire organization in just one season. Yet for some reason Manning chose the Broncos, a team that is more than just a quarterback away from making the Super Bowl, even if it’s #18. This is a defense that has major problems, and the last we saw of them, they gave up 509 yards in a 45-10 playoff loss to the Patriots last season. It’s clear that John Elway played a huge role in bringing Manning to Denver. I get it, it’s hard to say no to Elway. Maybe Manning chose Denver because he wanted a challenge? If that’s the case, he’s sure got a tough job ahead of him as the Broncos get the luxury of playing the AFC North and NFC South this year. In case you aren’t aware, those might just be the two best divisions in football. Of course there is the whole health factor as well. It’s not like Manning is young anymore. This is a 36-year-old quarterback who is coming off of four neck surgeries. You can’t tell me you won’t be a little worried every time he gets sacked. As for Tim Tebow? Yeah, he’s still on the team. Remember him? The same guy who inherited a 1-4 Broncos team only to lead them to a playoff win over the Steelers? Yeah, him. The fact of the matter is that neither John Elway nor John Fox ever believed in him. He wasn’t their guy. Tebow was Josh McDaniel’s guy. Even with every miraculous win Tebow would somehow pull of, Elway never looked happy. We should have known that the last pass Tebow would throw in a Denver Broncos uniform would be in that playoff loss in New England. 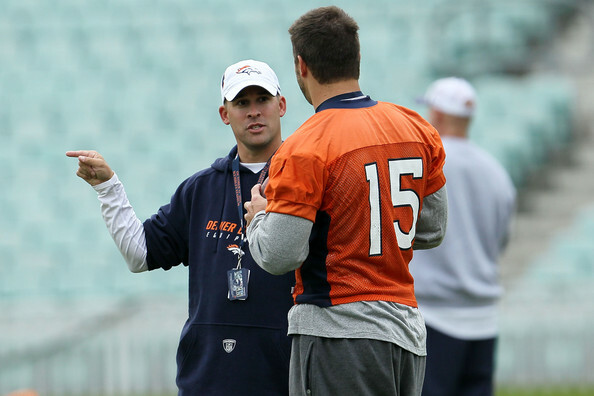 Now the Broncos will look to trade him, and for Tebow, that’s the best move. My vote is to send him to a team like the Dolphins or Jaguars. He’d boost ticket sales the moment he was acquired and he’d put the team back on the map. After what he did last season he deserves a chance to be a starter. This entry was posted in NFL and tagged AFC, Arizona Cardinals, Denver Broncos, Indianapolis Colts, Jacksonville Jaguars, John Elway, John Fox, Josh McDaniels, Miami Dolphins, New England Patriots, New York Giants, NFC, NFL, Peyton Manning, Tennessee Titans, Tim Tebow, Washington Redskins, Wesley Kaminsky. Bookmark the permalink.